Title : Book of Hours. Map maker : Higman done for Vestre. Size : 7.0 x 4.0 inches. / 17.8 x 10.2 cm. Description :Book of Hours (Horae use of Rome) printed page circa 1507, Higman done for Simon Vestre with hand colored engravings, borders in gold and other colors. The type is Gothic in red and black with illustrations from metal cuts. Ornate hand colored engraved borders on both sides. 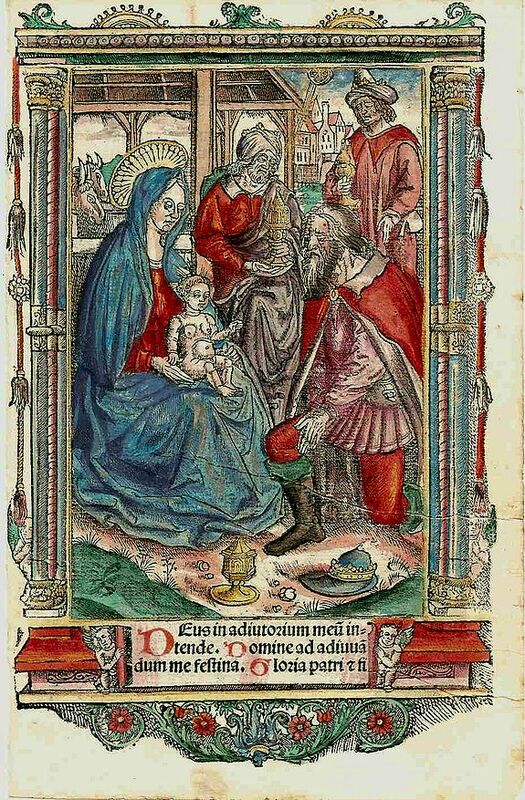 Full page illustration of the Baby Jesus in the Virgin Mother's lap. Condition : Good condition some age coloring to paper.